Well here is one of the super secret projects I have been working on lately. I'm working on a new project with my team of playtesters here and we need a name for the game. I would appreciate any input you guys could give there is a huge list of names already in and we are voting between them. If anyone has any ideas though please let me know ill add it to the list. You will probably have to join over there to vote just so you know. I don't know if anyone went over and checked it out but if you did the voting has progressed into the finals. Here is the new link, voting ends thursday so please cast your votes soon. I will show off some of the stuff for the game as soon as we have our color Test Blanks printed out. I voted for Doomsday Gears... but the name Steam Titans is very good! Yeah doomsday gears is my favorite that we came up with doesn't look like it's going to win though. Like i said when i posted it though it's for the work-in-progress name. Well the name ended up being Steam Titans but I have posted a Work in progress thread if anyone want to take a look. Looks interesting! I will definitely keep my eye on it. The reason I have never liked games like Magic: The Gathering that use those type of patterns is the little guy can never win in those fights. A 1/1 going up against a 3/3 the only way they can win are cards like instants (like giant growth +3/+3). Our game will have instants but I don't have a good reason for giving a aircraft bonus' damage out of the blue. In magic it could be explained by a spell but in the theme of this game it wouldn't work. We are working of some stuff though. Also if we did the same thing as magic the gathering we would end up sued by them because the game would end up being more of a clone of that game instead of our game. And They PATENTED THE WHOLE THING...bastards. The other reason is most card games like Magic: The Gathering people at least in my area use dice for counters anyway so they always have them sitting around the table. If we give them a reason to have them they don't care so much. I use Magic the gathering as a example but most ccg card games are the same like pokemon, Ugiooh (er however that is spelled), ect. Thanks for posting though I appriciate it. Makes you think about stuff when people ask you questions. I agree that a little randomization is nice... it may slow the game a little (fastest is to compare) but the added "element of danger" and the chance of pulling a "hail Mary move" is well worth it! I think I was misunderstood I vote for randomization too!!! I really just think that using additional pieces is not neccessary in the card game - because you can use cards to measure everything. The randomization can be achieved when you put some number on the card (on the first pic there is the spades Jack, on the second pic the 1 and 2). Then, when the "roll" is required, you draw new card, check the number and discard it. See the card with the bullets? Under the character card? This is a life counter in bang. 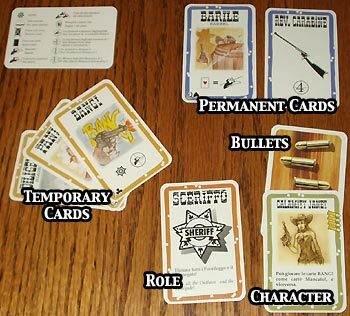 The bullets are on the back of the character card. 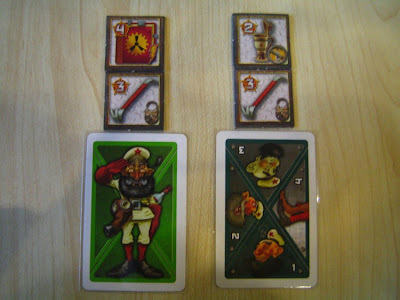 You simply get two characters at the setup of the game, choose one and use the second card face down as the life counter. It's the great thing about cards - you can use them in so many ways! And its easier to just take a pack of cards anywhere without fear of losing some small parts and counters. Our mechanic for solid damage bonus's is that we have armament cards which add damage bonus' to attacks. The thing is they will be attached to a aircraft face down and only turned up when 2 opponets fight then they remain face up from then on. This gives even more of a era of mystery to a battle you never know for sure if you will be in for because these cards can make or break a engaugment. I do like the mechanic of the number on the card and you just draw but it doesn't lend to escalation very well. We have bombers that can destory factories and mines your opponet will control. They can do that damage and also have more defense and more firepower than most fighters. But can easily be taken down by a few fighters. Unless it's escorted by fighters then it gets intresting. Without letting all cards do the same dice roll of damage it is a little harder to get variety in the diffrent types of aircraft. (there are other things that make them diffrent but not many. Also the dice mechanic uses d6's the easiest to get and the plan is it will come with them in the box for both players. I love the idea of hidden equipment! It gives the whole new options for the startegy. Have you considered allowing players to keep equipment turned face down as long as they want (but without bonuses ofcourse). She played Magic with me but she lost interest pretty quick a steam punk card game on the the other she may will be keen to get into. So what types of cards are you going to have? * A range of planes from each nation? * Merc planes that fight for both sides? * Will there be altitude? each plane starts at a certain level and can either throttle up or dive down. so you will get attack bonuses for being higher then your enemy. * will you be able to put your aircraft into a squadron which will increase their attack dice during aerial combat? * can your pilots "bail out" of a doomed aircraft? planes can be rebuilt but you'll soon run out of men if you do not watch it. remember they are resources as well. * will there be cards that can help you attack/defend/or out wit your opponents? eg. attack from the sun: instant ~ enemy planes can not see attacking planes due to the glare from the sun. Planes that attack may shoot as they scream past the enemy planes. basically the plane that just attacked from the sun gets a bonus attack on an enemy target. * "Light Fog/Fog/Heavy Fog" play on enemy formation/plane/character plane: due to fig these planes are grounded for X turns [1-3 roll a d3] or have 3 fog cards, light fog [1 turn], Fog [2 turns] heavy fog [3 turns]. * Light wind/Gust of Wind/Strong gust" could be used to clear a fog card. Light winds removes light Fog, Gust of wind removes Fog, and Strong Gust removes Heavy Fog. The other thing what ratio of commons to uncommons to rares to Ultra rares to Mega rares are you planning on doing? Will this "Just" be a card game or are you hoping for some to "collect" this game? certainly look forward to seeing how it turns out if you need play testers let me know. Lots of questions and some that we had not considered yet. I'm going to holler at you on chat and pick your brain a bit on some of this stuff. At the moment I want the game to be ready to play when you open the box. I hate the CCG element of magic and how it ends up being the person with the most money wins. That is until you get to pro tournaments where they all have the same decks because that certain set was so OP that it ruined the game that year. (hate rage about magic over). That being said that doesn't mean i wouldn't consider booster sets which would have expansion cards or new nations. If you or anyone else on the board wants to playtest let me know I will send you stuff as we get ready to playtest. Along with a NDA ect. Altitude will be hard to replicate in a card game but not impossible. Mercs maybe, Spies will definately be a part of it though. Plane upgrades - Armament cards are this, better guns, armor, speed, abilities. Formation is in the works but we are not sure how we will handle it yet. I think bailouts will be handled either shuffling the card back into your deck, or they will have to make a roll to survive. Not sure yet. Would be a good place for a instant so that you could return him to your hand. Im trying to keep the game as simple as possible pre testing but we want to bring land and sea into it eventually so there will be a diffrence in what resource cards certain craft can capture. Fog & weather are definately possible solutions to add realistic elements to the game thru Luck cards (instants). A fog rolls in and your opponet can't find the mine he was trying to capture that turn is perfect. As well as mid air collissions ect. Luck cards won't at least innitially change attack and defense but they will effect the gameplay greatly. So if I get it right, there will be three decks? One for each player and the third one being the luck deck? Also I agree on your CCG opinion. I usually enjoy the "games-from-the-box" better as the offer much better power balance for players. Anyway - when ready for testing, I believe me and my friends would be glad to help! actually each deck will have their own luck cards. Because you will have a few extra cards per deck so that there can be some variance in play style. But you will be allowed so many luck cards and some of them are diffrent for each faction. There will be 3 decks though. one for each side and the resource deck. Resource cards are put in between players and they have to capture them in order to get resources each turn from them. This represents land grab and the struggle over resources during war. In the case of the pirates they will be able to steal resources if they directly attack the opponets resource producing mines/factories. In the case of the nationals they will destory them instead. One deck is about denial one is about theft. At least as is now. All that could change when we see that the pirates get resource way to easy this way or the denial kills chances of the pirates getting good crafts. Thanks I will contact you when playtests come up. Know it will probably be a print and play at that point so be ready to print out a few decks. My Wife and I will put our hands up to play test. I think with any type of game you do you need to look at the "bigger" picture. to make sure the Time line is correct, that it does not go stale, it keeps the players interested. Having an idea on potential expansions is good it will give you options latter on to make the game bigger take it to a new direction. or simply add new flavour. I also think having it as a Collectable game with would be more viable then just a "Game" you need to sell cards and there is only so many starter sets you can sell before it plateaus out. By having expansions it will keep the revenue going. the only thing to consider is not "banning cards" "deleting sets" like other companies do and frustrating the gamers. the other reason having a card ratio is you yourself as a company can sell the single cards. this is again giving you more capital so you can expand the business and the game. plus you can set what cards are more valuable to a collector. brain storm some ideas around expansions. what do you want this game to do. get your story arc done first. that is the one thing alot of Magic players enjoy is the Story behind the card game. It will enable you to plan out how the game unfolds, what cards are needed. What style of play each faction is able to do. having the arc can also give you the ideas for future expansions. The idea of doing that doesn't really work with the method we are going with for the first printing. The first printing will be a kickstarter page which means we will only run so many units and that will be based on what kind of response we get from the community. That means a stand alone game is more likely a better product for the type of sales we want to do. If we make money on that first run and can afford to make a second run that means we did well enough to make more and to consider making a expansion. Which we can also pop on kickstarter and do that all over again. The business model for small game companies is changing thanks to kickstarter and I think it's for the better because you can tell your market just by who supports the game in the first place. Not to say that what you are suggesting wouldn't work. But it lends to a game that would have to be picked up by a publisher and then we get into alot more red tape to quite simply get our business off the ground. I think it would be far easier to just self publish the game. That is unless I find the right publisher/distributor which I haven't yet. New post up on boardgamegeek. Im looking for feedback on the type of die mechanic people would like to see if we do use them. My thoughts so far are something similar to risk where you roll comparative dice and higher numbers remove dice from the next phase. the 6 and the 4 remove the 1 and 3 from the next round and destory the aircraft. examples in the post over there. I like the "Risk" rolling style. stat? Or does it work some other way? No you got it. The system is broken as hell though there are a few holes in that for the thing I wanna do with it keep looking at that thread ill post updates on what I come up with. Well, the solution might be to add another stat. Named Firepower or something similar. That would represent the number of dice rolled for both attack and defense. Attack stat would represent the actual strength of succesful attack and Defense would be more like toughness or wounds... Then the side which lost all dice during the engagement would be damaged - i.e. would loose as many "defense points" as is the attack value of winner. Or this might be applied after every roll. Dice system problem is solved. We will be using a totally different system than what I initially was going to. Basically the attack will be written on the card as 1d6, 2d6 ect. (maybe a few 1d6+1 if we want to differentiate between different fighters gun power). Defense will be written as 5,6,10 ect varies by the armor on the aircraft. All aircraft involved in a particular engagement roll their attack at the same time. Each side adds the result together and tells the opponent how much damage they did. The opponent then distributes the damage among their aircraft. You can leave as little or as much defense left on each aircraft as you want as long as you distribute all the damage. After this damage is distributed each side has a opportunity to bug out. (there will be a instant card that allows the opponent to make a free attack at a enemy that is bugging out.) All damage done carries over to the next attack phase. After that's over you both roll again if both sides are still in combat. repeat till a victor is declared. Let me know if anyone sees any obvious holes in this. We changed the info avalable on the card crew is the number of crew/pilots that can be attached to the aircraft (most have 1 or 2, some transport planes have 3 Navigators and gunners ect., Loadout is the number of armament cards that can be attached to the aircraft. Some fighters will not have a loadout while others will have 3 just depends on the fighter.